The long-awaited Force Friday II took place two days ago, where fans got their first chance to purchase several new Star Wars items, many of them tying into Star Wars: The Last Jedi, which opens in theaters December 15. One big component of Force Friday is the release of new Star Wars novels, one of which, Leia: Princess of Alderaan by Claudia Gray, seemingly dropped quite the huge hint for the Amilyn Holdo character played by Laura Dern in Star Wars: The Last Jedi. It seems that Vice Admiral Amilyn Holdo will actually be an LGBT character. You may recall that, back in May 2016, a report from the Gay & Lesbian Alliance Against Discrimination (GLAAD) specifically mentioned Star Wars: The Last Jedi in a report where they were pushing for more diversity in major Hollywood movies. It seems that Disney and LucasFilm took that suggestion to heart, with Screen Rant reporting that the book Leia: Princess of Alderaan includes a passage where Holdo and Leia Organa are joking about inter-species relationships, where it seems clear that Holdo is not straight. Here's the excerpt from Leia: Princess of Alderaan below. While Amilyn Holdo obviously doesn't come right out and say that she's a lesbian or bisexual characters, it certainly seems that she doesn't wanted to be "limited" in her choices for her romantic partners. Still, it even though this was hinted at in this novel, there is no clear-cut indication yet that Holdo's sexuality will be either discussed or referenced in any way shape or form in Star Wars: The Last Jedi. Still, given that there has been a big push for more diversity in major tentpole blockbusters, it's certainly possible that this could be addressed in a tactful way that doesn't detract from the story at hand, much like how John Cho's Sulu was revealed as a gay character in last year's Star Trek Beyond. 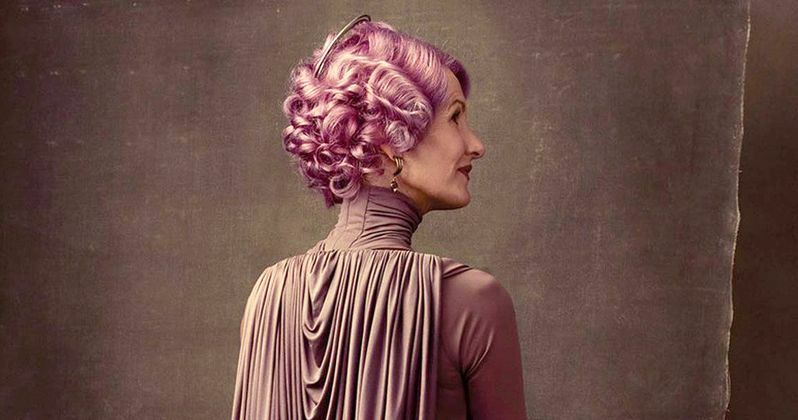 Amilyn Holdo is just one of several new characters who will be introduced for the first time on the big screen in Star Wars: The Last Jedi. New cast members include Benicio del Toro as the mysterious D.J., Kelly Marie Tran as Rose Tico, a Resistance maintenance worker who goes on a secret mission with Finn, Veronica Ngo as Rose's sister Paige, a Resistance fighter, with Tom Hardy also rumored to be playing a Stormtrooper in a secret cameo, which has yet to be confirmed. Some fans had hoped that LucasFilm would release a new trailer for Star Wars: The Last Jedi in conjunction with the Force Friday festivities, but since that didn't happen, it remains unclear when we'll finally get to see some new footage.